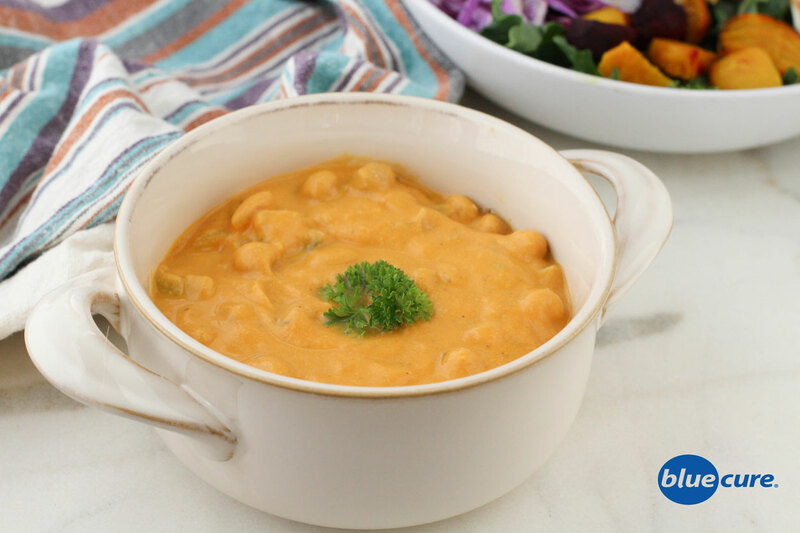 This sweet potato soup is sure to be a crowd pleaser with its creamy texture and balanced notes of sweet and savory. Serve it warm on a cool day or serve it chilled for a refreshing meal on a hot summer day. For added nutritional punch, serve the soup with a side salad filled with greens, roasted beets, red cabbage, and red peppers. Aim to fill each meal with even more colorful fruits and veggies! Wash the sweet potatoes. Roast them in their skins for 30-40 minutes at 400F or until soft all the way through. Wash and chop the veggies. Saute the onion with 1-2 tablespoons of water. Add the sweet potatoes. Continue to saute and add more water as needed to keep the veggies from sticking. Add in the carrots and the celery and continue to cook until the veggies reach desired texture. In a high speed blender, combine the roasted sweet potatoes with the cashews, miso paste, and 2-3 cups of water. This may need to be done in steps depending on the size of your blender. In a pot, combine the cooked veggies, sweet potato broth, and another cup of water (if desired). Rinse the chickpeas and add them to the pot. Add the thyme, sage, bay leaves, cinnamon, and black pepper. Simmer the soup on low heat until it reaches desired temperature. Stir often so the soup doesn’t burn. Dish out in bowls and top with fresh parsley, if desired. Serve with a side salad and enjoy!